Been working on some card-making this week among other projects. I buy lots of stamps for cards I want to make but never seem to get around to doing it. Well, I spent yesterday afternoon in my room creating cards. I’ve never considered myself a card maker so it takes me three times as long to finish one – much longer than building a scrapbook page or mini book! 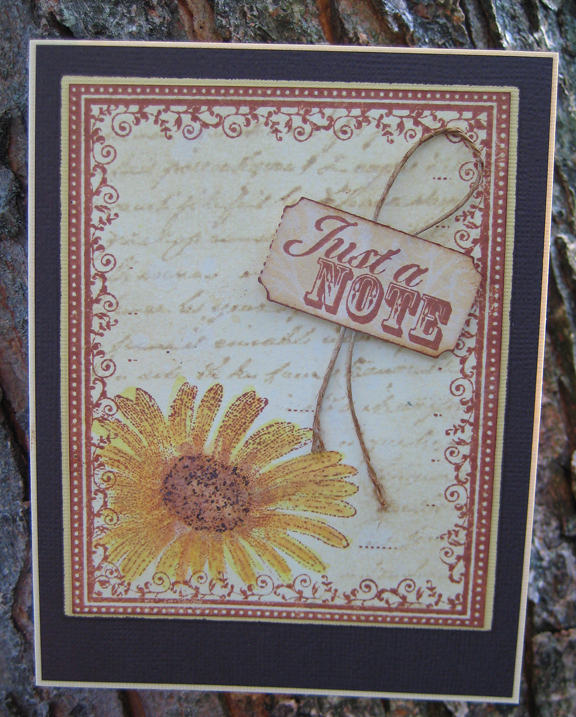 I have this Hero Arts cling stamp – Daisy Label – which is a framed stamp with journal lines running through the center. I wanted to use only the frame so chose not to ink the inside areas of the stamp. The frame is stamped with Ranger Archival ink because it is waterproof once heat set so I was able to watercolor the flower and spritz the entire stamped area with shimmer mist made from mixing Ranger’s Perfect Pearls and water in a mini mister. Added the stamped sentiment, a couple of mats and adhered it all to the card. And … I have a card! One day I hope to be inspired to write something in them and actually pop them in the mail to someone special. Are we having great weather or what this week! Rachel and her dogs came to visit today. We planned on kayaking so left Bella and Molly with grandma and we drifted on Appleton Lake for a couple of hours. How nice. Finished the day off with dinner outdoors then went to the Yum Yum Tree for dessert! Grandma loves the Yum Yum Tree and we love having an excuse to go there. Class scheduling is going well through September and October. I’m working on class samples and have classes scheduled at Scrapbook Peddler, Scrapbooks Galore & More and Capture a Memory so far. Check the calendar regularly on my blog for updates. You say you are not a card maker. I would strongly disagree!! If that card was for sale, I would by it. Love the tecniques used. Will be looking for your card classes. Miss you & ST.